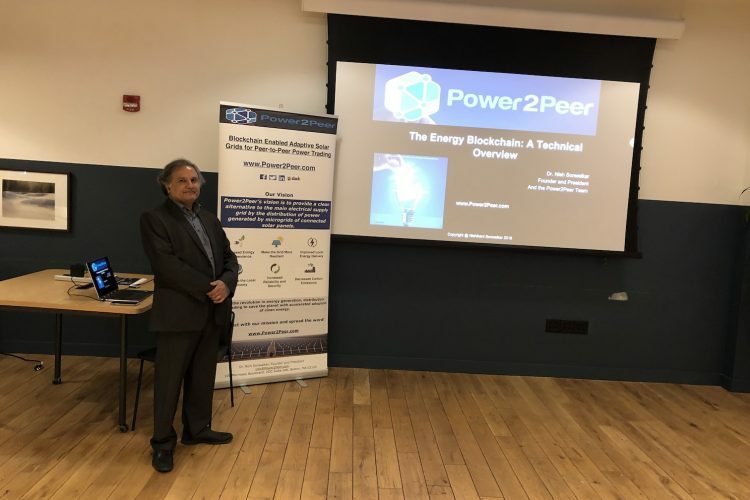 Tuesday night marked another successful event for Power2Peer, this time back in Cambridge at WeWork on Mass Ave. Power2Peer founder and CEO Dr. Nish Sonwalkar addressed a diverse assembly of blockchain enthusiasts, solar advocates, and prospective investors, offering a “technology tour” of Power2Peer’s advanced solar microgrid system. Dr. Sonwalkar covered several facets of the technology driving microgrid development, from blockchain platforms such as Ethereum to the IoT devices that collect data and make real time analytics possible. After walking the audience through the tech behind solar microgrids, Dr. Sonwalkar also spoke on the global impact of Power2Peer’s mission. “In Uganda there is tremendous need for efficient solar energy systems, because they don’t have access to the grid there. Many homes have no access to power unless they are able to obtain some kind of solar panel,” Dr. Sonwalkar said Tuesday night. Earlier this month, Dr. Sonwalkar travelled to Uganda and saw first hand the demand for Power2Peer’s microgrid technology. Dr. Sonwalkar then opened the floor and fielded questions from the crowd. If you are interested in joining the green energy revolution by investing in Power2Peer, please visit this page to see some frequently asked questions, and check out our StartEngine campaign here. By supporting clean energy, you can do your part to create a better world. So invest like the future depends on it!